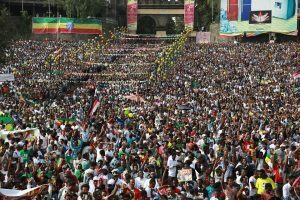 A historic rally in support of Prime Minister Abiy Ahmed was held in Addis Ababa’s Meskel Square on 23rd June in the presence of hundreds of thousands of people from across the country and from different backgrounds. The rally was intended to encourage and recognize the changes brought about by the Prime Minister since he assumed the Premiership post. 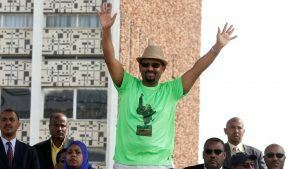 Addressing the rally, Prime Minister Abiy praised the people of Ethiopia for their determination and commitment to being part of the wave of radical changes that are sweeping the nation, and encouraged people to believe in the prospect of a bright future for the country. The PM stressed that “change does not come through the involvement of a few active players with a majority being spectators but the participation of all. He emphasized the need to put in place a rich culture of professionalism at all levels of governance and underlined the irreplaceable role intellectuals and experts could play in bringing fresh ideas and finding new and innovative ways of doing things. Shortly after his speech, a grenade attack occurred at the rally, claiming the lives of two individuals and leaving scores injured. The Prime Minister was unscathed and in a live broadcast on Ethiopian Television shortly afterwards, expressed his condolences to the families of those affected and said the attack had been orchestrated by anti-peace forces who wanted to undermine the rally. The perpetrators will face justice. A dozen suspects have so far been arrested and are currently under police investigation. “All victims are martyrs of love and peace,” the Premier said. Experts from the United States Federal Bureau of Investigation are providing technical assistance in bringing the perpetrators to justice. A few hours after the live broadcast, the PM visited the victims, offering his heartfelt encouragement and gave blood. A transcript of the PM’s speech is available. Requests can be sent to the Press Office at press@ethioembassy.org.uk.